There will be several meetings during the month of October to allow legislators to hear concerns about Branstad’s move to privatize Medicaid. Please attend meetings in your area to express your concern. Friday, October 9, 10 to 11:30 a.m., North Iowa Area Community College – Conference Center (500 College Drive, Mason City). Friday, October 9, 10 to 11:30 a.m., Falcon Civic Center – Meeting Room (1305 5th Avenue NE. Independence). Wednesday, October 14, 3 to 4:30 p.m., Iowa Wesleyan College – Howe Student Activity Center (601 N. Main Street, Mount Pleasant). Wednesday, October 14, 6 to 7:30 p.m., Marshalltown Community College – Conference Center (3700 S Center Street, Marshalltown). Tuesday, October 27, 3 to 4:30 p.m., Burlington Public Library – Meeting Room A (210 Court Street, Burlington). Wednesday, October 28, 3 to 4:30 p.m., Muscatine Community College – Larson Hall room 75 (152 Colorado Street, Muscatine). 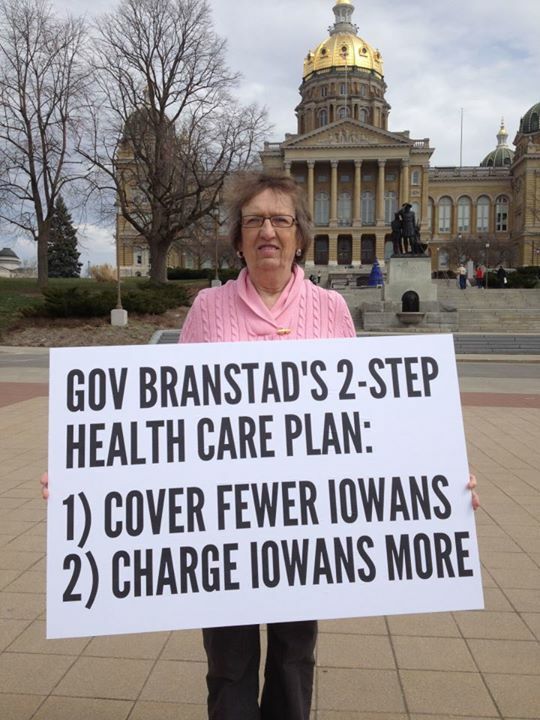 This entry was posted in Health Care & Medicare and tagged Branstad, medicaid in Iowa, privatizing Medicaid in Iowa. Bookmark the permalink.